Every time I turn out for Brighton next season I will be determined to show Bill Nicholson how wrong he was to let me go… to show him and Spurs that there is a lot of the old Bobby Smith fire left – and that it is going to be used to help Brighton bid for better things. Brighton and the Fourth Division are a challenge to me. I could have gone to bigger clubs, could have stayed in London, could still be in the First Division with Fulham. But now I’m an Albion man, and great, new experience lies ahead. I’ve never played League football outside the First Division, for I have only been with two clubs, Chelsea and Spurs. I gave Tottenham nine years of loyal, all-out service, but come the new season I aim to bang them in with Brighton. I still can! I’ve been told I’m in for a tough time; that I will suffer plenty of knocks; that the football in the Fourth Division is too crude to suit me… But I can take care of myself in this new sphere. I’ve always been able to do that. As to the standard of play I’ll just have to wait and see, but I know there will be a lot of “football” from Brighton with a manager like Archie Macaulay in charge of us. Strange how quickly the tide can turn for you in this game. Seven months ago on a crisp November evening I led an England attack which whipped eight goals past Northern Ireland. Jimmy Greaves got four that night, Terry Paine helped himself to three and I got the other. There can hardly have been such a sudden transition as mine – from England to the Fourth Division. But that’s how the cards have been dealt and that’s the hand you have to take. When I think of the £5,000 Brighton paid for me, I know I should be glad it was so low because it made it easy for me to move. I read that Brighton’s “return” for getting me is already beginning to show with increased season-ticket sales. That pleases me: it doesn’t increase the size of my head. It pleases because it shows the interest is being heightened. It is certain that a successful Brighton side would mean gates many Second Division clubs would envy. So I’m really looking forward to having a go with them. I know quite well that what I have been, and what I have done, will not cut any ice next season. To everybody I shall be Bobby Smith, just starting again – for Brighton. I’m looking forward to it immensely. I want to do well for my new club… I feel sure I can. There’s one thing they can count on – 100% effort. That’s the only way I know how to play this game. Perhaps unsurprisingly, given his pedigree and positive attitude, Bobby Smith was a phenomenal success in the 1964/65 season. Considering the last home game the previous season had attracted under nine-thousand, the box office value of Smith was incredible. 20,058 packed into the Goldstone to watch Smith score twice in a 3-1 win over Barrow on the opening day of the campaign. In all, he hit twenty goals (including nineteen in the League) in just 33 games and his swashbuckling style and deft touch also helped five other players reach double figures. 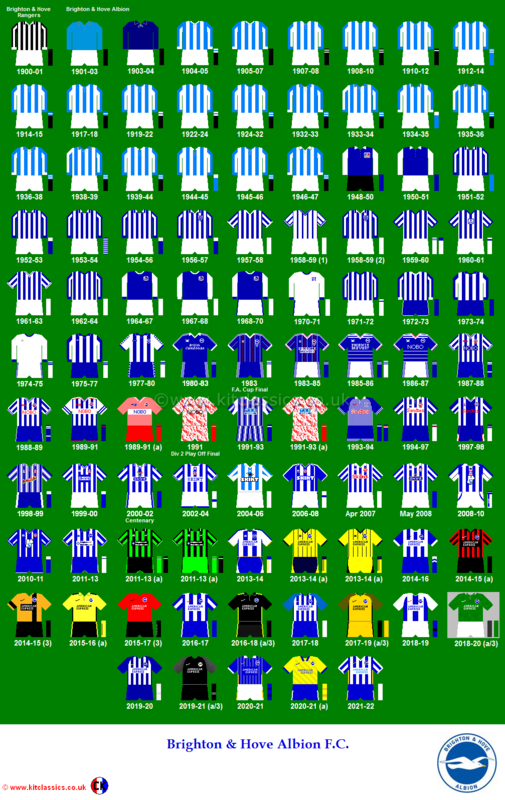 In the end, Brighton won the Fourth Division Championship in style, scoring 102 League goals. Like most footballers of that time, Bobby enjoyed a fag and a drink. Unfortunately, he also liked a bet, correction, he loved a bet, the only problem was he wasn’t very good at it. The level of his gambling debts had allegedly reached a point where the then Spurs boss Bill Nicholson felt that with Smith past his best on the pitch, his problems off of it might have a detrimental effect at White Hart Lane. Legendary local bookmaker George Gunn was aware of this situation and, along with the Brighton board, managed to broker a deal which saw Smith’s extensive gambling debts paid off as part of his transfer to Brighton. Despite the successful first season, the good times were not to last. 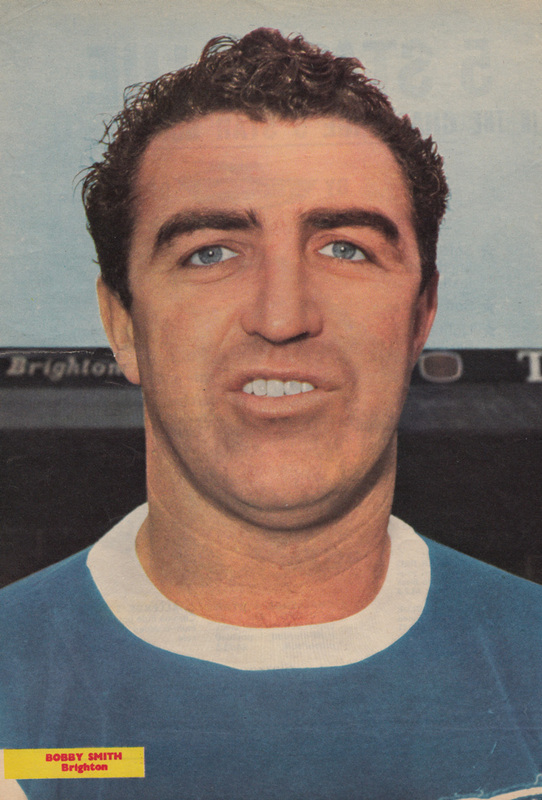 Manager Archie Macaulay suspended Smith for two weeks when the centre-forward reported for pre-season training in July 1965 weighing over 15 stone. Then, Smith’s controversial articles for a Sunday newspaper led him to be transfer-listed and, finally, sacked in October 1965. 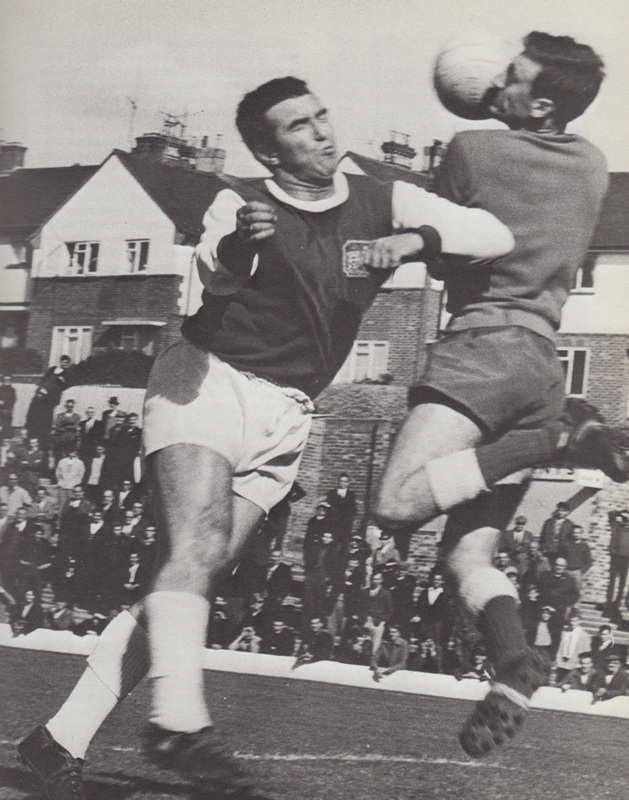 Nevertheless, his presence and magnificent contribution to the Championship season, with a buzzing Goldstone filled to the rafters, is still remembered as one of the highlights of supporting the Albion in the 1960s.